A transmission electron microscope image of a mesoporous silica nanoparticle, showing the tiling with triangles and squares, and the Fourier analysis (inset) showing 12-fold symmetry. Image: Lab of Uli Wiesner, Cornell University. When Israeli scientist Daniel Shechtman first saw a quasicrystal through his microscope in 1982, he reportedly thought to himself, "Eyn chaya kazo" – Hebrew for "There can be no such creature." But there is, and the quasicrystal has become the subject of much research in the 35 years since Shechtman's Nobel Prize-winning discovery. What makes quasicrystals so interesting? Their unusual structure: atoms in quasicrystals are arranged in an orderly but non-periodic way, unlike most crystals, which are made up of a three-dimensional, orderly and periodic (repeating) arrangement of atoms. The lab of Uli Wiesner, professor of engineering in the Department of Materials Science and Engineering (MSE) at Cornell University, has now joined scientists pursuing this relatively new area of study. And much like Shechtman, who discovered quasicrystals while studying diffraction patterns of aluminum-manganese crystals, Wiesner came upon quasicrystals a bit by accident. While working with silica nanoparticles – from which the Wiesner lab's patented Cornell dots (or C dots) are made – one of his students stumbled upon an unusual non-periodic but ordered silica structure, directed by chemically induced self-assembly of groups of molecules, or micelles. 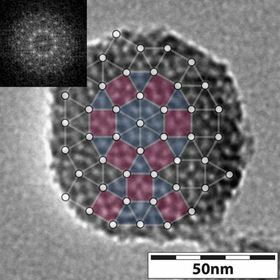 "For the first time, we see this [quasicrystal] structure in nanoparticles, which had never been seen before to the best of our knowledge," said Wiesner. His research team proceeded to conduct hundreds of experiments to capture the formation of these structures in the early stages of their development. They have now reported their findings in a paper in Nature Communications. Lead authors are former MSE doctoral student Yao Sun, current postdoc Kai Ma and doctoral student Teresa Kao. Other contributors include: Lena Kourkoutis, assistant professor of applied and engineering physics; Veit Elser, professor of physics; and graduate students Katherine Spoth, Hiroaki Sai and Duhan Zhang. To study the evolution of silica nanoparticle quasicrystals, the best solution would be to take video of the growth process, but that was simply not possible. "The structures are so small, you can only see them through an electron microscope," Wiesner explained. "Silica degrades under the electron beam, so to look at one particle over a longer period of time is not possible." The solution? Conduct lots of experiments, stopping the growth process of the quasicrystals at varying points, imaging with transmission electron microscopy (TEM) and comparing the results with computer simulations conducted by Kao. This imaging, performed by Sun and Ma, gave the team a sort of time-lapse look at the quasicrystal growth process, which they could control in a couple of different ways. One way was to vary the concentration of the chemical compound mesitylene, also known as TMB, a pore expander. The imaging, including cryo-TEM conducted by Spoth, showed that as the TMB concentration increased, the micelles became bigger and more heterogeneous. Adding TMB induced four structural changes in the mesoporous silica nanoparticles, which started off as hexagonal and wound up as dodecagonal (12-sided) quasicrystals. "The more TMB we add, the broader the pore size distribution," Wiesner said, "and that perturbs the crystal formation and leads to the quasicrystals." The other way to make these structures evolve is mechanical. Starting with a hexagonal crystal structure, the team found that by simply stirring the solution more and more vigorously, they introduced a disturbance that also changed the micelle size distribution and triggered the same structural changes "all the way to the quasicrystal," Wiesner said. According to Wiesner, a lot of the discovery in this work was "serendipity", the result of "hundreds and hundreds" of growth experiments conducted by the students. And the more insight gained into the early formation of these unique particles, the better Wiesner’s understanding of silica nanoparticles, which are at the heart of his group's work with Cornell dots. "As the techniques become better, the ability to see small structures and better understand their assembly mechanisms is improving," he said. "And whatever helps us understand these early formation steps will help us to design better materials in the end."